We wanted something unique and whimsical for our twin girls, but something that wasn't too "baby-ish" and would grow with them as well. 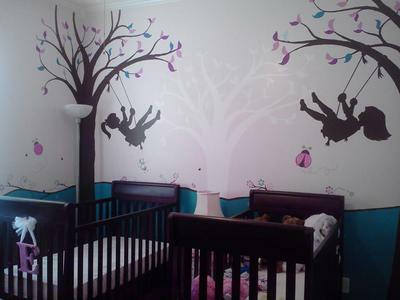 We used stencils to put mirror images of a little girl swinging from a tree swing over each crib - with slightly different hair-do's for a little individuality. where did u get these stencils of the girls swinging? This is so cute! Great work!! Love it! Love it...looks stunning. Love the idea of the different hairstyles, shows you might be twins but different personalities.